Timing belt - DAYCO - teeth 150, width 30mm. The timing belt guide roller - SKF (58mm x 33mm). The timing belt tensioner - SKF (58mm x 33mm). Hydraulic timing belt tensioner - SNT, TNT, SKF. Water pump + 2x Gasket - Good Quality. Mazda 6 (GG / GY). 06.2005 - 08.2007. 06.2005 - 11.2010. GENERALLY, ALL OUR ITEMS ARE HELD IN STOCK. NO WAITING PERIODS, IMMEDIATE DISPATCH. CUSTOMERS SHOULD SATISFY THEMSELVES THAT ANY ITEM CHOICE MADE IS SUITABLE FOR THEIR INTENDED PURPOSE OR USE. 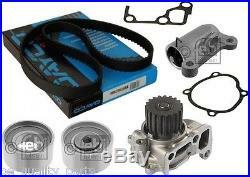 The item "TIMING CAM BELT KIT WATER PUMP MAZDA 5 6 GG 2.0Di GH GH MZR DAYCO DIESEL 2005" is in sale since Thursday, August 28, 2014. This item is in the category "Vehicle Parts & Accessories\Car Parts\Engines & Engine Parts\Other Engines & Engine Parts".